I’ve been thinking recently about the nature of my work and which aspects of it I enjoy the most. In a role that will often straddle the realms of design and development, whether editing copy, evaluating the design of an interface or refactoring code, I've come to realize that my interests lie in the act of review and refinement. I'm a big believer in iteration and not treating a website as ever being finished. I hope what’s been released this year can act as a foundation, and that the design will evolve in the years to come. In the intervening years, as tools have improved and best practices have matured, I've tweaked the design and refactored the code, and developed a component library in the process. 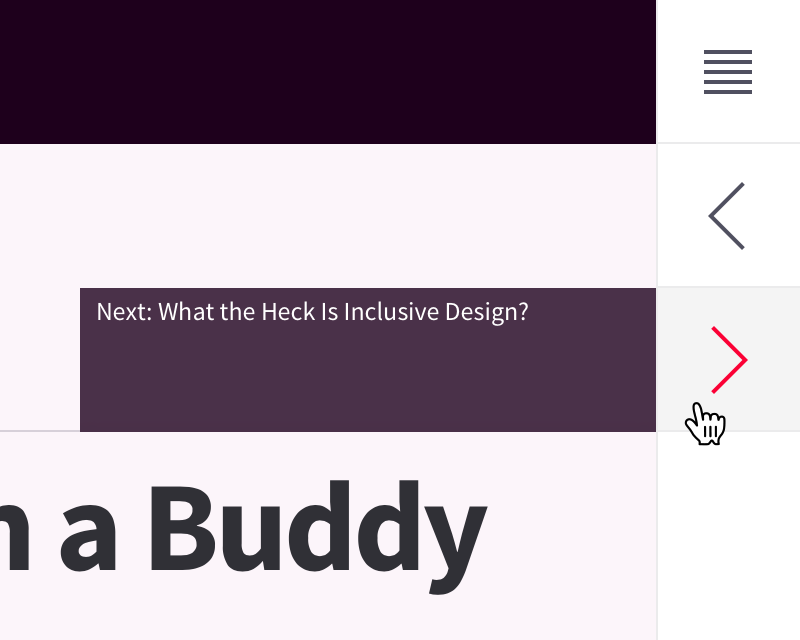 This year I've been listening to people like Laura Kalbag talk about accessibility in terms of universal design, and followed blogs like Heydon Pickering’s Inclusive Components, which covers how to design and implement common interaction patterns with an inclusive mindset. All of a sudden, the thorny subject of accessibility has felt more approachable and less dogmatic. Before I start, a note of thanks. After making an initial set of changes, I asked my friend and accessibility expert Francis Storr to review my work. He uncovered a number of additional issues, partly the result of his experience in this area, but also from having tested the site with a range of different assistive tools. The menu button (.c-menu) was not adjacent to the element it controlled (c-navigation-drawer). Moving focus around the page like this can be confusing, especially if it’s not managed properly. All navigation on the site was grouped together, even though each set of links served a different purpose. Moving the navigation towards the top of the page meant the button and drawer were now adjacent to each other. The menu button is no longer two-faced; it is and always will be a button. A downside to this approach is that the navigation can be heard every time you visit a new page. Again, we can use a skip link, but this time one that points to the content block (#main). Rather than hide this focusable element from certain users, it becomes visible on focus. This structure may be less ideologically pure, but it’s far more pragmatic. This became a recurring theme. Indeed, having given up any hope of the HTML5 outline algorithm ever being supported by browsers, I stopped using h1 for section headings and followed the recommendation that heading ranks should be used to convey document structure instead. As the most interactive component on the site, the menu was the unsurprising focus of my review. The design dictates that the navigation drawer should behave like a dialog, an interface pattern that brings with it a number of assumptions. These are described in detail in eBay's MIND pattern, but essentially a dialog draws focus away from other elements on the page and is modal; only elements within it can be operated while it is open. The solution was to mark everything outside the dialog as "inert". Rob Dodson describes this in more detail in his video Accessible Modal Dialogs. Implementing this can be a little bit fiddly, but a proposal to introduce an inert attribute would make this easier to manage. In the meantime, the proposal provides a polyfill so you can use this feature today. A good amount of accessibility comes down to labelling things that rely on visual appearance alone to convey meaning. Much like the alt attribute allows us to describe images, aria-label (and its relations) extend this ability to other elements. Navigation component that allows users to move between articles in a series. No indication was given as to the role these links play and their relationship to each other. Using role='img' on the SVG icons, but not providing any accessible names, was akin to including images without alt attributes. The first thing I did was give this set of links a label. I originally choose Articles navigation. However, in testing VoiceOver would announce: navigation, Articles navigation. As the nav element already describes the role, we need only provide additional information about the type of navigation this is. Secondly, on the advice of Francis, I added focusable='false' to all inline SVG markup. This is due to a bug in IE11 where SVGs are keyboard focusable by default. Accessible markup is useful markup. link, more articles by drew single right-pointing angle quotation mark. Continue links before and after improvements. While they look similar, the revised design sounds much better. I also made improvements to the styling of author names in article summaries. Originally, these were distinguished from the rest of the excerpt by styling them as uppercase text. Francis pointed out that some screen readers will spell out uppercase letters (regardless of whether they appear in the HTML or have been altered by CSS) if they don’t spell a known word. For example VoiceOver and NVDA have trouble with Chris Coyier's surname, so his name would be read aloud as Chris C-O-Y-I-E-R. The simple fix was to distinguish names using emboldened text instead. If I'm honest, I’ve been somewhat arrogant in the past, thinking that by using semantic markup and progressive enhancement, I needn’t worry too much about accessibility. While using the right elements, and considering an interface not only in visual terms is important, this is the absolute bare minimum. An understanding of different assistive technologies, and willingness to test with them, is just as important. Thinking about accessibility led to me improve overall usability, too. For this years set of articles, we no longer link to author's websites from article excerpts. This historical holdover was poorly resolved previously; if you happened to click on the author’s name you would be taken to their website, not the article as you would expect. We also included comment counts that were linked to the comment section on the article page (which itself linked to a separate comments page). Madness! Now, each article has one link; to the article. 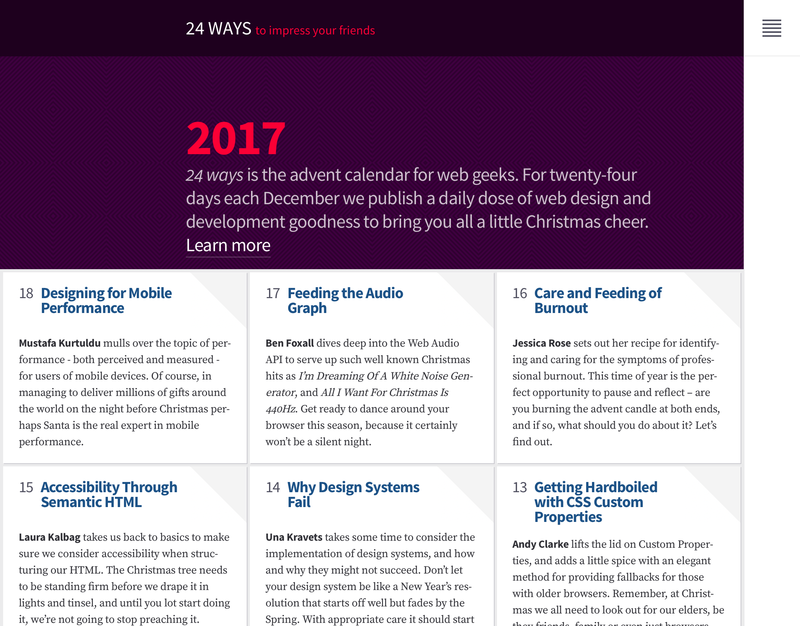 A home page that once involved tabbing through 24×3 links, is now less noisy and much easier to navigate for everyone. Other refinements included ensuring the site is responsive in terms of height, as well as width, ensuring the navigation menu can be dismissed when you click outside of it, and a review of overall performance. These might not be considered accessibility improvements, but I’m not so sure. To suggest this would be to think accessibility is an entirely separate concern. In fact, making changes that benefit one set of users will typically benefit all. Creating something new will always attract attention and admiration, but there’s an under-celebrated nobility in improving what already exists. While not all changes may be visual, they can have just as much impact. I know that, had we decided to redesign the site this year, many of these improvements would not have been made. Hopefully, this overview will encourage you to look at your own projects and think about similar changes you might make. Having a growing awareness of the issues, and expanding your knowledge of the tools available is an essential requirement of working on the web. However, don’t keep that knowledge saved up for the future; if you can, go back and fix your older projects too. I am certainly willing to test with assistive technologies, but it seems out of our budget to purchase the required software. I end up falling back to free browser plugins which may not cover the same quirks as full-featured software. Which assistive technologies are currently essential to test in? Is there any popularity/usage information that you are aware of (I haven’t found anything yet)? Are there any testing services that provide access to assistive technologies for developers? If you’re on Windows, the NVDA screen reader is free (although they do ask for an optional donation). If you’re on macOS, you have the VoiceOver screen reader built into the OS. iOS devices have extensive built-in accessibility and Android is getting really good. Depending on the Android vendor, you may or may not have the TalkBack screen reader installed. If you don’t, then it’s downloadable in the Play store. The webAIM site has good resources for getting up to speed with desktop screen readers. If you’re interested in popularity, have a look at WebAIM’s most recent screenreader survey. You’ll see that JAWS is, as of early 2018, the most popular, but that does come with a hefty price tag. NVDA is the next most popular and is a solid tool for testing. Make sure you’re testing on multiple browsers as they all behave differently with assistive technology. I’d also recommend Rob Dodson’s A11ycasts videos on YouTube as they cover a lot of good content. Testing in high-contrast mode on Windows simply needs a keyboard shortcut to toggle the setting on or off, and testing for keyboard accessibility is as easy as testing your app without a mouse. I also test using speech-dictation software. This is built into most operating systems, although I’d recommend getting a copy of Dragon Naturally Speaking for Windows as it’s currently more robust than the built-in Narrator. Dragon’s also available for Mac, but I’ve not tried it.